Thanks for sharing your run/walk strategy Gill. I know you usually run/walk, but its good to share this with CV and any other new runners who might check into our thread. Right now I'm trying to maintain a steady run because I don't feel like putting in the time for longer, slower runs. My emphasis has been speed on the 5K range. A couple years ago I regularly added a weekly long-slow-run where I would run/walk intervals for 60 to 90 minutes. I ran my one and only 10K as a run/walk. Can you share the name of the author who advocates the technique, Gill? We haven't posted that in a long while. I had time and motivation for a lovely longer run this morning - off to work for the rest of the day now! all around the lanes, I did a big circuit which was GLORIOUS! lots of green stuff - trees, fields, flowers, birds, rivers, hedges, moss - lovely, lovely, lovely! 5.15 miles in just over an hour. I'm not able to run for long before I need a walk break....... and that's OK, I get good exercise for muscles and heart and lungs. It's nice having the activity trackers because I can repeat things and it'll let me know if I've done better than last time. It's a nice gentle motivator. I stopped to take photos, and blow my nose! You'll get there! We started this thread because it is hard to keep going with the habit - and we needed the support, so it's great to have you here with us. Thanks, Brian and Gill, for the support! You are such an inspiration. I love reading your posts and seeing how well you are doing with your runs. I look forward to a time when I will be running like that. I like your spirit CV! Keep working slowly and you will get to the level you want. Nice walk Gill! Excellent cross training. And, you slipped in an adventure to boot. I ran in a light rain on Tuesday. It was a tough workout. I did a slow 5K in 37 mins. I did a couple 400 meter walk intervals in there. It's all good. I did it anyway. I woke to a bright, warm, sunny day here! Amazing after the winter weather yesterday! I walked along the coast to a little fishing village called Mousehole (pronounced Mowzel) and had a turmeric latte in the cafe. Then wandered around the village doing some clues for a trail I'm testing for a company that make Treasure Trails. Such fun! I didn't finish it - so will need to go back again. I got in PLENTY of good walking: 2.98 miles there, and 3.11 miles coming back a slightly different way. 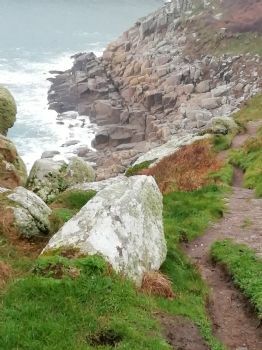 The return route took me UP and UP and UP some newly created steps on a footpath, so I got plenty of really good cardio work done! I got in a decent workout today. I did a walk/stair stepper combo for a little over 30 minutes. It is a step in the right direction. This is a slow process for me, but I am not giving up. I will continue to work on my running. Fantastic! Around 36 mins and 3 miles is my current definition for a good workout. I got out for a walk/run this morning - it was a VERY windy day which took my breath away! I did very short walk/run intervals (about 30 paces walking, 30 paces running) testing out my chest after over a week of coughing. I did 3.20 miles in 36.26 mins. Good enough! It comes and goes in waves........... as long as we keep the intention at the forefront of our minds, we'll get there - walking, jogging, running. I walked about 4 miles yesterday, which was lovely, and the first day in a while that my legs didn't feel tired. As you reminded me, Brian, this tiredness was a temporary blip with this virus I've had (still coughing). I'm relaxing today (Sunday), and I'll see how I feel in the morning - there's a possibility of a run. I must confess that I have not been doing well with my running. To be honest I cannot remember the last time I did any running. I have been walking on a daily basis, which is ok. However, I do need to get back on track. My goal for next week is to run three days. I am hoping I'll do more, but my base goal is to jog for three days. Thatâ€™s odd because just 5 days ago you went on a 10k. I know the feeling. It may pass. Walking parkrun is a fine plan. Do what feels right and good. Great run, Brian! Well done. At the moment I feel like I'll never run again - but I'm sure that feeling will pass. Maybe I could go to parkrun and walk it! Thursday morning was a rush. I was glad my running togs were packed and read to go. I ran between rain showers again. Same plan as Tuesday adding an extra 400 meters to the run. I ran a little faster this time. Actually averaged under 7 mins per kilometer. Thanks! I'm already packed for Thursday. Tonight, I'm joining my old Wednesday night hikers for a trip up to Dirty Harry's Balcony for dinner. PS - I intended to say I set a goal in the Runkeeper app to run 2 times a week through May. Let's see how I do. I downloaded Strava where many of my parkrun friends track and share their workouts. I haven't used it yet. I like Runkeeper, I like the history I have built up in it. I like that jot syncs with SparkPeople. However, I like the idea of connecting with a community of runners that are mixed 'real' and 'virtual' on Strava. Well done, Brian. Great run! It's Tuesday and I got out the door for a run after work, 4k a little over 30 mins. I was out between rain falls. It was all good. That's awesome. You have me in a state of admiration. I did nothing. I went out for a long relaxed run this morning - 1hr 22mins at an average pace of 13 mins/mile. I went up a very steep hill, stopped to use the toilet half-way round and generally enjoyed myself. I saw a seal in the sea - which was nice. I clocked up just over 10k. Yes, that is cross-training. Well done. Thank you. I did 10 mins hula-hooping instead - cross-training? I was planning to run today - but don't feel well enough. Never mind - this will pass. Awesome! Great job getting out there in nasty weather. I got out after work for a 30 min run at 5.30pm. The sky was very black - and the air was freezing. But I enjoyed it - aimed for an 'easy run' today - in keeping with my training plan! I'm pooped now though - am heading for bed and it's only 18.20h! Parkrun today - at Penrose, Helston. Another absolutely gorgeous Spring day with sunshine, fantastic light, sharp air. I forgot to take my parkrun barcode with me - I knew I'd forgotten something! Never mind - I was #223 so I know I was between 33:46 and 34:01. I used my Strava app, which gave me 32:40. This is probably a better estimation of my actual speed, because the first minute or two of parkrun are walking due to the sheer number of people trying to get going! Having the Strava app, and my TomTom, kind of freed me up to do my own run somehow. 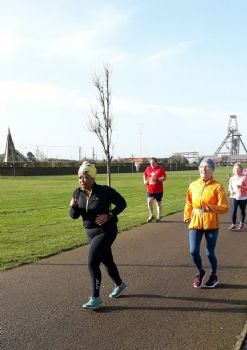 I didn't care about my parkrun time. I stopped and walked when I needed to, and I sprinted when I wanted to. My heart-rate was still in the 'peak' zone the whole time - even though I wasn't out of breath. I'm either very fit, or very unfit- can't decide which! I've done more than 20,000 steps today - I'm staying home now. I was up and out at 6am - and rewarded with a gorgeous ball of orange sun, a fairy-tale mist rising off the sea around St Michael's Mount, and a song from a little wren. The tracking is showing me that I'm pretty consistent in terms of performance, speed, distance. Well done Gill! I hope Strava motivates you. CV- Getting out walking every day is building some intention into your day. Keep it up. I have not been too well this past week or so. I cannot seem to get on track. I have been walking (or doing some sort exercise) everyday, but it has not been very intense or very long. I am not giving up. I am going to get back on track and increase my time and intensity. Well, I woke to a dry morning and decided to go for a run with Strava and TomTom! I did a loop from town, clockwise - which gave me a climb to begin with, then a lovely run downhill with the stream towards the sun and sea. it also gives me 1k splits which show that I run faster uphill than downhill! It must be the increased effort? the heartrate is very interesting - I was in 'cardio/perform/peak' after the first 4 mins warm-up. And I was over my maxium recommended heart-rate from time-to-time. It's not 100% accurate, but it was good to know that I am getting the recommended level of activity to benefit my heart. The fitness band is brilliant! I've clocked up about 7 miles a day! It's very motivating - yesterday I went for an evening walk just to top up my steps. Brian ~~ thanks for the support and encouragement! Gill~ I am excited to hear about your fitness band. I hope you like it. The fitness band has arrived, and I've donwloaded TomTomSport and Strava - no idea how to use them yet - but will learn! I'm looking forward to getting my fitness band so that I can see how much I actually do! I pushed past my own objections today (rain, time, negativity) and got out in the rain for a 30 min run/walk along the promenade. On the way back I went onto the beach as there was a low tide - and ran a bit on the pebbles. I like the wild feeling - I love trail running really, but don't do enough of it! My phone told me I'd done about 3,200 steps for the 30 min walk/run. That's OK. Thank you, CV! 2600 minutes is impressive for over three winter months. You are doing great. It just occurred to me that I have tracked over 2700 minutes of walking, jogging, stepper-ing since the beginning of the year. It is starting to warm up and I'm excited to get outside. Tuesday was my 4 year running anniversary - the first Tuesday after the Spring time change 2015. I went back to where it all started, the Cedar River Trail (where we have parkrun). I did a steady out and back today. Not a long way, 4K in about 30 minutes. Time is approximate because my phone battery gave out again. It wasn't even that cold! It is time for a new phone. So ... Day 1 of Year 5 is done. I will try to run Thursday morning to really start a streak. It's the first day of my 11-day holiday. Two days is a little meager, but I hope is enough to carry me through. Running when traveling is a whole other distraction. I will keep my time and distance down around 4K/30 minutes to make it no big deal. Gill - too gadabout the Heartlands course still being so narrow. It sounds lovely anyway. No, it's still narrow and constricted - even more so now as it twists and turns through gardens and mine-workings........... we all have to 'keep left' and the faster runners pass us on the right. It's a bit like running a slalom in places! There are lots of marshals because of the twisty route, and perhaps to keep an eye that people don't cheat by cutting off corners!!! I had a few seconds panic near the end, because it was loops, there was a marshal carrying a sign saying "see me 3 times, then turn" - well, as I approached him for the 4th time, I said "oh, no! I think I've gone wrong - I've seen you 4 times" but no, I was right, what his sign should say is "when you see me the 4th time, turn into the finish stretch"
Well done Gill! Getting back after 5 months is enough for this parkrun. You did great. Good idea matching to someone you know and know is a little slower then you at your best. Sets a good pace for your return. Is the new course wider then the old course? I remember the Hartlands route as being narrow and constricted. Gill ~~ it sounds like you had a lot of fun at your parkrun. That is something I have never done. I'm not sure if I ever will. I did a 5k once and hated it ~~ too many people. I do have a car, but there are places I can walk to. But it has been too cold, at least for me. This past week it was below freezing (about 10-20 degrees at the highest). I am ready for warmer weather. Once it does warm up, I'll get out more. Plus, there is a school track near my house that I can take advantage of, if I so desire. Parkrun 5k done! It wasn't my fastest - in fact, it was my slowest to date! But I enjoyed it! The day was not rainy, so I went. It was quite a nice day in fact - a little cold, but not too chilling. They'd changed the route of the course since I was last there - it was quite circuitous, but more interesting than the previous route. It's a 3.5 lap kind of course which I found a bit boring before, but the new route is more interesting with twists and turns! Also I'd not done a parkrun for about 5 months, so I buddied up with a woman I recognised who does a slightly slower time than me and basically took it easy. I also didn't stop for as many walk breaks as usual - because of the slower pace I suppose. One of the marshalls said 'there's a 9 in the date, so no walking today!'. However, my legs did ask for a couple of short walk breaks. My time was 35 minutes and a few seconds. It felt really good to do it. Afterwards I got a lovely oat-milk cappuccino from the cafe, then went into a little shop that sells Cornish language books and was able to pick up a dictionary I wanted before I had to get the bus. Well done - Spring will come eventually. When I first started running, I went out in my jeans pretending to be just walking. But I had my sports bra on, and broke into a little jog every now and then. Seems funny now, looking back on it, by my first 'runs' were done in jeans and a fleece! I suppose what I'm saying is, maybe you could wrap up warm and get out for a bit of a walk - even if you have to go somewhere to walk (I don't know if you have a car). How cold is it where you are? Gill and Brian ~~ you both are such an inspiration! The weather here is still too cold to get outside. I'm walking on a daily basis (inside). However, I've reached a bit of a rut when it comes to much more than that. I'm blaming the weather and haven't given up on becoming a "real" runner. It's just going to take time, which I have plenty of. I got out today for a 20 minute run too. I was partly inspired by you Gill. I also can to realize that we move the clocks ahead this weekend. Tuesday is my running anniversary! I have to run next week, so I figuring might as well run this week. Next run will be on the river trail. Awesome, Gill. It's been a while since any of us have logged a run on this thread. Glad you overcame your bum fears. 20 mins run/walk combo along the prom at 7 am. I wore the new leggings that I wasn't sure about - they were very comfortable. My Contra hoodie comes down quite low at the back, and I forgot about my bum. Who cares?! I knew 1500 was a typo before seeing the actual number on your feed. You move a lot more then that just pottering around. No, I don't rely on my phone either - it was just that I noticed the steps counter on my phone. Because I'd not been at work, and had been here, there, and everywhere, I'd had my phone on me all day! You're right, Brian - it's a typo- it was 15,000 something! I don't always rely on my phone to track my steps. It doesn't always track them correctly. Plus I don't always have it on me. I did a walk/jog combo today for a little over 35 minutes. 1,550 is okay I guess. But, I saw your activity feed and it says you went 15,534. That is Awesome! I had my phone on me all day today and it tells me I did more than 1550 steps! Gil ~~ that is a lot of walking! I did a total of 55 minutes of walking yesterday. I did 45 mins walking today - to the gardens. My friend gave me a lift back. But 45 mins was good as my feet were already tired from yesterday's long work shift. On Sunday I did a 90 minute walk as part of my work (supporting a man who likes to go out for a walk!) - boy did I sleep well last night! This morning I ran through the garden at work to the bin area and thought how wonderful it was to be running in the early morning air. I can do this. Not today. Not tomorrow, but I can do this! Today I'm planning a walk to visit a local garden. We definitely need warmer weather. Once the sun comes out and it warms up more, I am hoping I can start doing some walk/jog intervals. Right now I am sticking to walking, jogging, and using my stepper in my house. Brilliant! You spread the word. parkrun was cancelled again here in Renton because of snow and ice on the course. We really need spring to show up. Nice thing today - one of my colleagues told me that he, his partner and their two young boys had all been to parkrun for the first time. He is a runner and I've told him about parkrun many times. I felt as proud as if he'd been my own son! I've been doing shorter intervals for so long now I'm not even sure I can run for 5 mins without stopping! I'll have to try it! Yes Gill, 5 run /2 walk. I find it good for building lung-power and for stretching out my runs, running longer. Yesterday I ran one extra interval from last ... no, 2 weeks ago (I reduced my time and distance in the snow). I did 6 intervals with 5 minute warmup and cool down at either end. I'm sore today ... I don't think the soreness is from yoga. I have a 2-day streak of at least 10 mins of yoga going. Is that run 5/walk 2? CV - "Exercise every day" -- that is wheat habit is made of. Way to go! You are setting a good foundation for regular running or whatever exercise you choose. Gill - ditto for going to yoga class! I, on the other hand, took last week off. Great! Let's see what we all get up to this week. Today I have a yoga class - which also gives me the opportunity to do 2 x 30mins walking - there & back! Gill ~~ what a beautiful picture. Thanks for sharing. This past week has been overwhelming busy and hectic. I did make a point to exercise everyday. However, I didn't do much running. I'm not beating myself up about it. Next week will be better. Yes, the weather was mild - about 12C - and there was low cloud on the hills which was damp. It was a very enjoyable hike. It was more adventurous than one I'd choose for myself - going across fields and farmland which I'd have got totally lost in without the app. Watching myself progress across the map with the GPS marker was cool - first time I've done that. That's so beautiful. It's good to see you out for an exploration walk like this. It dose seem like a long time since you have shared this sort of hike. If you get out like this regularly, running once a week would be fine. It all needs to balance out. I thought about going to parkrun today. Unfortunately, I thought seriously about it too late. It's been so long that I forgot when it started! I went for a proper strenuous walk/hike today - it was about 5 miles - and I was out for 2.5hrs. It's ages since I did a walk like that! On the coast path it's clambering up and over rocks - I had to walk through a waterfall of a stream rushing down to the sea - and then over the fields I encountered places where the ground was so very wet it was a foot-sucking bog! I had to seek out the submerged stony places. Lots of uneven ground. Lots of hill-climbing, steps and slopes. Really felt brilliant to be out there doing this - it was a good workout. I didn't meet a single soul on my walk! I stopped at this high point for a snack about half-way around. The sun is out. I am really tired because of being woken too early, but reckon I'm going out for a walk right now. I've had lunch. I have work later - but plenty of time for a,walk. Looks like everyone is doing a great job! My schedule is super busy and hectic this week and I am exhausted most of the time. I have not done any running in the last few days. However, I have still been walking. Right now, I am just glad that I am doing something. Exactly! Sounds like the same technique, yes. Way to go, CV! You are doing great. Gill, running on the snow is good for form too. Forces me to keep my footfalls directly under my center of gravity. Brian - I find on pebbles it's a bit like trail-running and/or mud - I lift my feet up and put them straight down (like running on hot bricks!) so there's no push-off with the foot - that's what causes slipping as the ground will not be stable enough to push-off from. I'm a bit like a prancing pony! Yesterday I walked for 35 minutes at work. Later in the day I did a walk/jog/stepper combo for 25 minutes. Good for you,Gill. You are ! Sounds like it was a lot of fun. We have very pebbly beaches here on the Sea shore. I have not tried running on them. Out on the Ocean beaches are sandy. I have run there! Love running along by the surf. I went out and ran/walked for 40 mins! It wasn't raining, wasn't too cold, still windy.......... but no reason not to go out and walk/run. I decided that as I couldn't get to parkrun, I'd run through the parks. It was really quiet, and I was delighted to see little pops of coloured blossoms appearing here and there. Then I ran back along the sea-front with the wind behind me, and took a diversion down onto the pebbly beach and thrilled myself by running along the tide-line as the surf came crashing in. The pebbles feel like a good workout for the ankle and foot muscles - adapting to the unstable surface. All-in-all - I had FUN! And this made me think about how I approach my running/walking - it needs to be FUN and not something I have to do. Brian ~~ Thanks for all the support and encouragement. And thanks for posting your runs. You are amazing and I look forward to when I will be running like you are . Sweetenufgill ~~ You are movin' and groovin'! Keep it up. I got out for my Thursday evening run. It wasn't easy with my mind full of icy roads and pending 'snowmageddon' about to hit Seattle. I chose to drive straight home after work and park my car safely in the garage. However, I changed into my running gear at work like I usually do. I barely went into the house (I fed the cat) before I took off for a run on the Eastside Corridor trail. It was hard day running too. I did 5/2 intervals for about a mile and a half before my phone battery died in the cold. I turned around and ran/walked back to my starting point, then walked back up the hill to my house. I'm happy to have followed through with it. You are sticking with it, CHRISTIAN_V3GAN! If you read those posts from 3.5 years ago and most of the 2,500 post after that, you see this running circle values the 'doing' over the speed. Super slow is okay. Gill, all that walking counts as fitness. You are not inactive at all. I really like that you are going to yoga class. I get out walking most days and have been doing run/walk for the past month. It's all good. I woke up to storm-force winds this morning, so I'm going to do an indoor walking workout. I realised that I haven't been inactive - on Wednesday I walked 30 mins to yoga class, and 30 mins back, so that was 60 mins. On Thursday I walked to the bus station, then to a friend's house - that was 30 mins. I'll post about the indoor walking when I've done it. I just went and read the first post in this thread - 2,500 posts, and 3.5 years of running/walking. Looked at in that way, this is a wonderful achievement! warm-up, brain-booster mile (15 mins), cool-down. I struggle with thinking that it's not enough - but it IS enough for today.